These diecut blank notecards featuring the famous Underwood No. 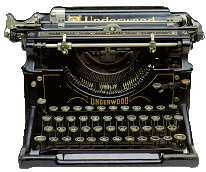 5 typewriter image with educational information on back. Superb printing and diecutting right to edge. Each set contains 6 notecards individually packaged in cello bag.